Staying in this evening? Settle in with a glass of wine and this extended excerpt from Long Road to Mercy, the first novel in the FBI Special Agent Atlee Pine series by bestselling author David Baldacci. 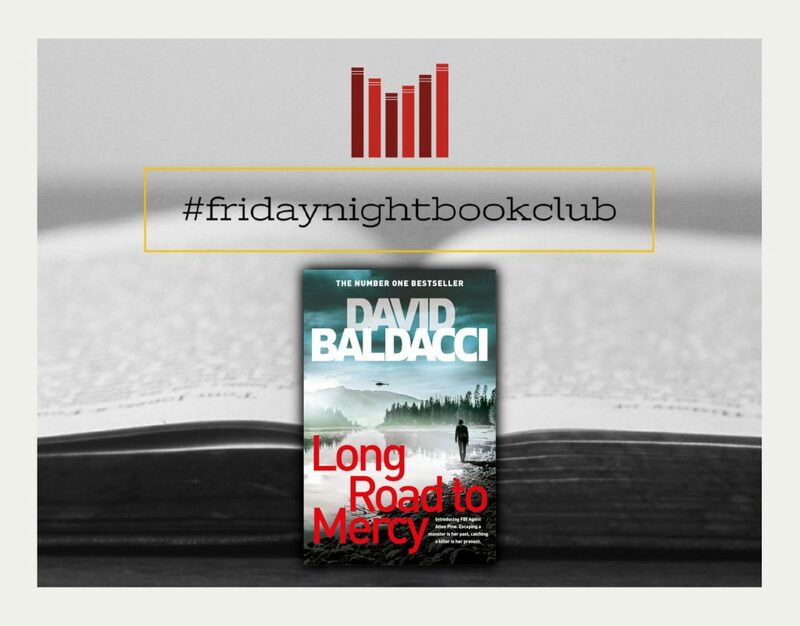 Long Road to Mercy is the first novel in the Atlee Pine series by bestselling author David Baldacci. FBI Special Agent Atlee Pine stared up at the grim facade of the prison complex that housed some of the most dangerous human predators on earth. She had come to see one of them tonight. ADX Florence, about a hundred miles south of Denver, was the only supermax prison in the federal system. The supermax component was one of four separate encampments that made up the Federal Correctional Complex located here. In total, more than nine hundred inmates were incarcerated on this parcel of dirt. From the sky, with the prison lights on, Florence might resemble a set of diamonds on black felt. The men here, guards and inmates, were as hardened as precious stone. It was not a place for the fainthearted, or the easily intimidated, though the deeply demented were obviously welcome. The supermax currently held, among others, the Unabomber, the Boston Marathon bomber, 9/11 terrorists, serial killers, an Oklahoma City bombing conspirator, spies, white supremacist leaders, and assorted cartel and mafia bosses. Many of the inmates here would die in federal prison under the official weight of multiple life sentences. The prison was in the middle of nowhere. No one had ever escaped, but if anyone did, there would be no place to hide. The topography around the prison was flat and open. Not a blade of grass, or a single tree or bush, grew around the complex. The prison was encircled by twelve-foot-high perimeter walls topped with razor wire and interlaced with pressure pads. These spaces were patrolled 24/7 by armed guards and attack dogs. Any prisoner reaching this spot would almost certainly be killed by either fangs or bullets. And few would care about a serial murderer, terrorist, or spy face-planting in the Colorado soil for the final time. showers automatically cut off, the toilets could not be stopped up, the walls were insulated so no inmate could communicate with another, the double steel doors slid open and closed on powered hydraulics, and meals came through a slot in the metal. Outside communication was forbidden except in the visiting room. For unruly prisoners, or in the case of a crisis, there was the Z-Unit, also known as the Black Hole. Its cells were kept completely dark, and restraints were built into each concrete bed. Solitary confinement was the rule rather than the exception here. The supermax was not designed for prisoners to make new friends. Atlee Pine’s truck had been scoped and searched, and her name and ID checked against the visitors list. After that she was escorted to the front entrance and showed the guards stationed there her FBI special agent credentials. She was thirty-five, and the last twelve years of her life had been spent with a shiny badge riding on her hip. The gold shield was topped by an open-winged eagle, and below that was Justitia, holding her scales and sword. It was fitting, Pine thought, that a female was depicted on the badge of the preeminent law enforcement agency in the world. She had relinquished her Glock 23 pistol to the guards. Pine had left in her truck the Beretta Nano that normally rode in an ankle holster. This was the only time she could remember voluntarily handing over her weapon. But America’s only federal supermax had its own set of rules by which she had to abide if she wanted to get inside, and she very much did. She was tall; over five eleven in her bare feet. Her height had come from her mother, who was an even six feet. Despite her stature, Pine was hardly lithe or willowy. She would never grace a runway or magazine cover as a stick-thin model. She was solid and muscular, which had come from pumping iron religiously. Her thighs, calves, and glutes were rocks, her shoulders and delts sculpted, her arms ropy with long cords of muscle, and her core was iron. She also had competed in MMA and kickboxing and had learned pretty much every way that a smaller person could take on and subdue a larger one. All of these skills had been learned and enhanced with one aim in mind: survival, while toiling in what was largely a man’s world. And physical strength, and the toughness and confidence that came with it, was a necessity. Her features were angular and came together in a particularly attractive, almost bewitching, manner. She had dark hair that fell to shoulder length and murky blue eyes that gave the impression of great depth. She had never been to Florence before, and as she was escorted down the hall by two burly guards who hadn’t uttered a word to her, the first thing that struck Pine was the almost eerie calm and quiet. As a federal agent, she had visited many prisons before. They were normally a cacophony of noise, screams, catcalls, curses, trash talk, insults and threats, with fingers curled around bars, and menacing looks coming out of the cells’ darkness. If you weren’t an animal before you went to a max prison, you would be one by the time you got out. Or else, you’d be dead. It was Lord of the Flies. With steel doors and flush toilets. Yet here, it was as if she was in a library. Pine was impressed. It was no small feat for a facility housing men who, collectively, had slaughtered thousands of their fellow humans using bombs, guns, knives, poisons, or simply their fists. Or, in the case of the spies, with their treasonous acts. Catch a tiger by its toe. She’d stopped once to use a restroom and to grab something to eat for the road. Other than that, it had been pedal to the floor mat. She could have flown into Denver and driven down from there, but she had some time off and she wanted to think about what she would do when she got to her destination. And a long drive through vast and empty stretches of America allowed her to do just that. Having grown up in the East, she’d spent the majority of her professional life in the open plains of the American Southwest. She hoped to spend the rest of it there because she loved the outdoor lifestyle and the wide-open spaces. After a few years at the Bureau, Pine had had her pick of assignments. This had been the case for only one reason: She was willing to go where no other agent wanted to. Most agents were desperate to be assigned to one of the FBI’s fifty-six field offices. Some liked it hot, so they aimed for Miami, Houston, or Phoenix. Some aimed for higher office in the FBI bureaucracy, so they fought to get to New York or DC. Los Angeles was popular for myriad reasons, Boston the same. Yet Pine had no interest in any of those places. She liked the relative isolation of the RA, or resident agency, in the middle of nothing. And so long as she got results and was willing to pull the duty, people left her alone. And in the wide-open spaces, she was often the only federal law enforcement for hundreds of miles. She liked that, too. Some would call her aloof, a control freak, or antisocial, but she wasn’t. She actually got along well with people. Indeed, you couldn’t be an effective FBI agent without having strong people skills. But she did like her privacy. Pine had taken a position at the RA in St. George, Utah. It was a two-person outfit and Pine had been there for two years. When the opportunity arose, she had transferred to a one-agent office in a tiny town called Shattered Rock. It was a recently established RA due west of Tuba City, and about as close to Grand Canyon National Park as it was possible to be without actually being in the park. There, she enjoyed the support of one secretary, Carol Blum. She was around sixty and had been at the Bureau for decades. Blum claimed former FBI director J. Edgar Hoover as her hero, though he’d died long before she joined up. Pine didn’t know whether to believe the woman or not. Visiting hours were long since over at Florence, but the Bureau of Prisons had accommodated a request from a fellow fed. It was actually twelve a.m. on the dot, a fitting time, Pine felt, because didn’t monsters come out only at the stroke of midnight? She was escorted into the visiting room and sat on a metal stool on one side of a sheet of thick polycarbonate glass. In lieu of a phone, a round metal conduit built into the glass provided the only means to verbally communicate. On the other side of the glass, the inmate would sit on a similar metal stool bolted into the floor. The seat was uncomfortable; it was meant to be. She sat awaiting him, her hands clasped and resting on the flat, laminated surface in front of her. She had pinned her FBI shield to her lapel, because she wanted him to see it. She kept her gaze on the door through which he would be led. He knew she was coming. He had approved her visit, one of the few rights he possessed in here. Pine tensed slightly when she heard multiple footsteps approaching. The door was buzzed open, and the first person she saw was a beefy guard with no neck and wide shoulders that nearly spanned the door opening. Behind him came another guard, and then a third; both were equally large and imposing. She briefly wondered if there was a minimum heft requirement for a guard here. There probably should be. Along with a tetanus shot. She dropped this thought as quickly as she had acquired it, because behind them appeared a shackled Daniel James Tor, all six feet four inches of him. He was followed in by a trio of other guards. They effectively filled the small enclosure. The rule of thumb here, Pine had learned, was that no prisoner was moved from one place to another with fewer than three guards. Apparently, Tor warranted double that number. She could understand why. Tor had not a hair on his head. His eyes stared blankly forward as the guards seated him on his stool and locked his chains into a steel ring set into the floor. This was also not typical of the visiting policy here, Pine knew. But it was obviously typical for fifty-seven-year-old Tor. He had on a white jumpsuit with black rubber-soled shoes with no laces. Black-framed glasses covered his eyes. They were one piece and made of soft rubber with no metal pins at juncture points. The lenses were flimsy plastic. It would be difficult to turn them into a weapon. In prisons, one had to sweat the small details, because inmates had all day and night to think of ways to harm themselves and others. She knew Tor’s entire body under the jumpsuit was virtually covered in largely self-inked tats. The ones that he hadn’t done himself had been inked on by some of his victims, forced into becoming tattoo artists before Tor had dispatched them into the hereafter. It was said that each tat told a story about a victim. Tor weighed about 280 pounds, and Pine calculated that only about 10 percent of that would qualify as fat. The veins rippled in his forearms and neck. There wasn’t much to do in here except work out and sleep, she assumed. And he had been an athlete in high school, a sports star, really, born with a genetically gifted physique. It was unfortunate that the superb body had been paired with a deranged, though brilliant, mind. The guards, satisfied that Tor was securely restrained, left the way they had come. But Pine could hear them right outside the door. She was sure Tor could as well. She imagined him somehow breaking through the glass. Could she hold her own against him? It was an intriguing hypothetical. And part of her wanted him to try. His gaze finally fell upon her and held. Atlee Pine had stared through the width of glass or in between cell bars at many monsters, a number of whom she had brought to justice. Yet Daniel James Tor was different. He was perhaps the most sadistic and prolific serial murderer of his, or perhaps any, generation. He rested his shackled hands on the laminated surface, and tilted his thick neck to the right until a kink popped. Then he resettled his gaze on her after flicking a glance at the badge. His lips curled momentarily at the symbol for law and order. The moment, an eternity in the making, had finally come. Atlee Pine leaned forward, her lips an inch from the thick glass.